We are excited to be an initial member of Twilio Marketplace and to showcase the combined value of our speech analytics and Twilio’s new dual channel recording capability. Today at Twilio SIGNAL, the developer conference for communications, VoiceBase, Inc., a massively scalable speech recognition and speech analytics API, announces it will be one of the initial Add-ons in the newly unveiled Twilio Marketplace. 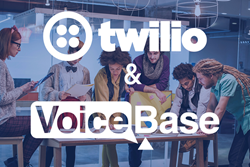 The Twilio Marketplace provides developers a catalog to discover, learn and install partner technologies, like VoiceBase, to enhance their Twilio applications. VoiceBase will have two Add-ons in the Marketplace initially, the first being ‘VoiceBase High Accuracy Transcription’ which delivers the transcript, automatically extracted keywords and automatically generated topics. The second Add-on, ‘VoiceBase PCI Redaction’ will enable Payment Card Industry (PCI) data redaction as well as the basic features from the first Add-on. For developers targeting ‘voice of the customer’ or ‘sales optimization’ applications, it is essential that their queriable repository of spoken information be free of PCI data. VoiceBase provides easy-to-use APIs that automatically transcribe audio and video, extract relevant keywords and topics and enable the instant search and discover of spoken information. Every month VoiceBase processes millions of recordings that allow users to search from the web or their mobile device into the timeline of a recording, and play the precise parts of a conference call or webinar, educational lecture, podcast or video interview for example. VoiceBase customers include contact centers, conferencing service providers, video and education platforms, telecom providers and Fortune 500 companies. VoiceBase is privately held and is based in San Francisco, California. Visit https://www.voicebase.com to learn more. Twilio's mission is to fuel the future of communications. Developers and businesses use Twilio to make communications relevant and contextual by embedding messaging, voice and video capabilities directly into their software applications. Founded in 2008, Twilio is privately held and has over 500 employees, with headquarters in San Francisco and other offices in Bogotá, Dublin, Hong Kong, London, Mountain View, Munich, New York City, Singapore, and Tallinn.